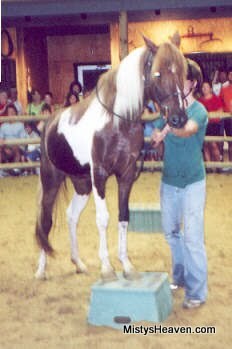 Misty's Chance of Rain, nicknamed Chance, is Rainbow's fifth offspring. She is a flashy dark chestnut pinto. Chance was born and raised on the Allens' farm in Pennsylvania. She visited Chincoteague for Pony Penning alongside her dam a few months after she was born. Chance has competed in English pleasure and has been a member of the Chincoteague Drill Team. A picture of her at a show is in Chincoteague Ponies by Victor Gentle. Chance has a sassy attitude because she is such a pretty pony who gets spoiled with attention. Chance had her first foal Misty's Struck By Lightning in 2005 and her second foal Misty's December Frost in 2007. Both foals are results of "secret meetings" with Lightning, who was known for such things. She currently lives at the Cool Winds Ranch in Texas with Lisa Christian and a host of other Chincoteague Ponies.